I've been trying to get out to meet people and make new friends lately. I grew up on Cape Cod and am a huge Red Sox fan. I've been using meetup.com to check out new groups to join and see what people are up to. Despite how much the Red Sox are hated in these parts, there are plenty of us New Englanders who have made NYC our home. There's a Sox meetup for Boston fans to get together and watch games. 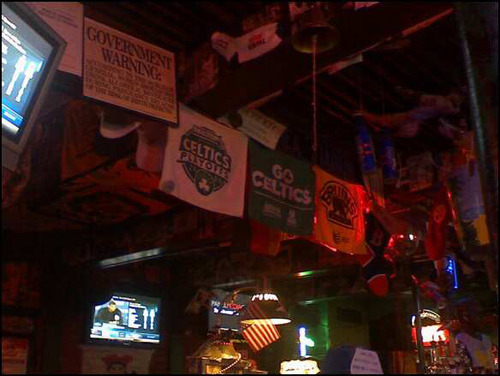 Lucky for us there are a few Boston bars in the city, and these little pieces of home always help to put a smile back on my face when I'm down. I made some new friends on Monday at Professor Thom's, and we went out again last night to Pat O'Brien's on the Upper East. Nothing like some good ol' beer pong and cheering on my fave team! We're talking about starting a softball team, which would be so much fun! If you're looking to meet new people and get out more (and who can't use more friends and fun outings?) check out meetup.com and sign up for a group or two that interests you.